I can't believe it's December already! Where has this year gone to? I hope you all had a fabulous Thanksgiving! My family and I surely did...we got to stay home and and enjoy a very relaxing holiday. I made gravy from turkey drippings for the first time and I didn't have any lumps whatsoever! That was one of the great highlights for me! Well, I thought I would stop in and post something since it's been a few weeks...yikes! Isn't this image just the most adorable one you've ever seen? It's a Pure Innocence digital stamp by Heather Ellis. She illustrates the cutest images and they are sooo fun to color! 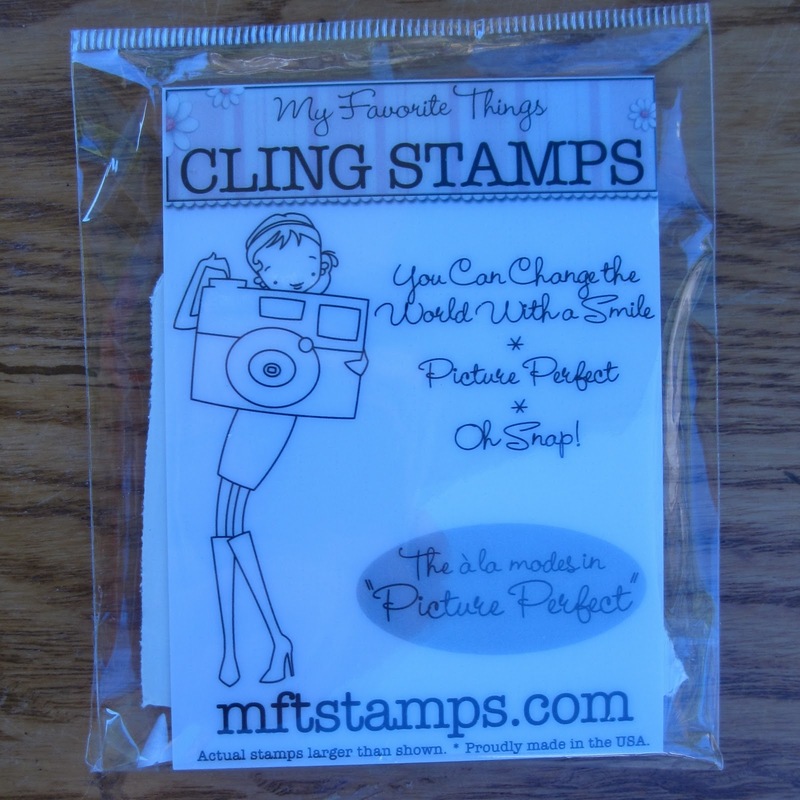 Many of her images are also available as clear stamps from My Favorite Things as well. This cupcake one just got released as a stamp. 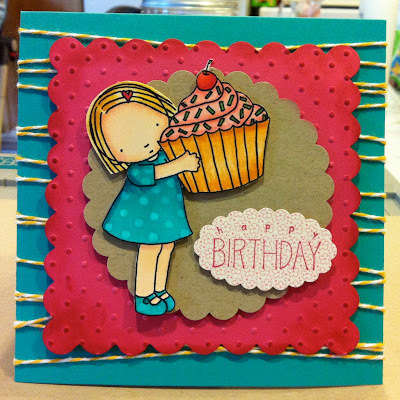 I started with a 5 1/2" square card base and using Bermuda Bay cardstock by Stampin' Up! I wrapped some Lemon Drop twine (doesn't that name sound yummy) by The Twinery all around the front of the card. I used a piece of SU! 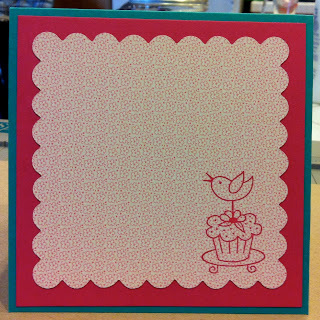 Melon Mambo cardstock and die cut the Scalloped Square die also from SU! and then ran it through the Swiss Dot (my all-time fave) Cuttlebug folder for texture. Then, I decided the scallops needed to have a more finished look, so I sponged some Melon Mambo ink all around the edges. The image is colored in with my Copic markers. For the dress, I used a combo of Blue Green colors and pressed the brush tip end of a colorless blender marker to add the polka dots. I held the tip down for just a few seconds to push some of the color out to achieve the polka dot effect. I mounted the image on a solid kraft scallop circle just so it would get lost in all the pink background. I used a bunch of foam tape for added dimension of each layer. I stamped the birthday sentiment in Melon Mambo ink on a piece of pink cherry blossom cardstock by The Paper Garden and punched it out using the small scalloped oval punch. 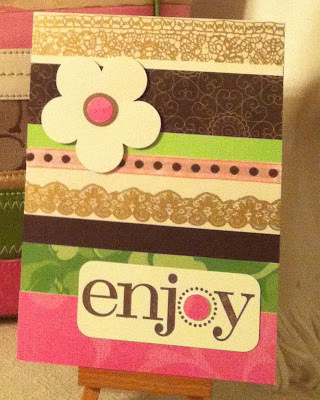 I LOVE this pattern cardstock sold exclusively from Stephanie's store! There are five other colors and if you want some, e-mail or call the store to place an order. 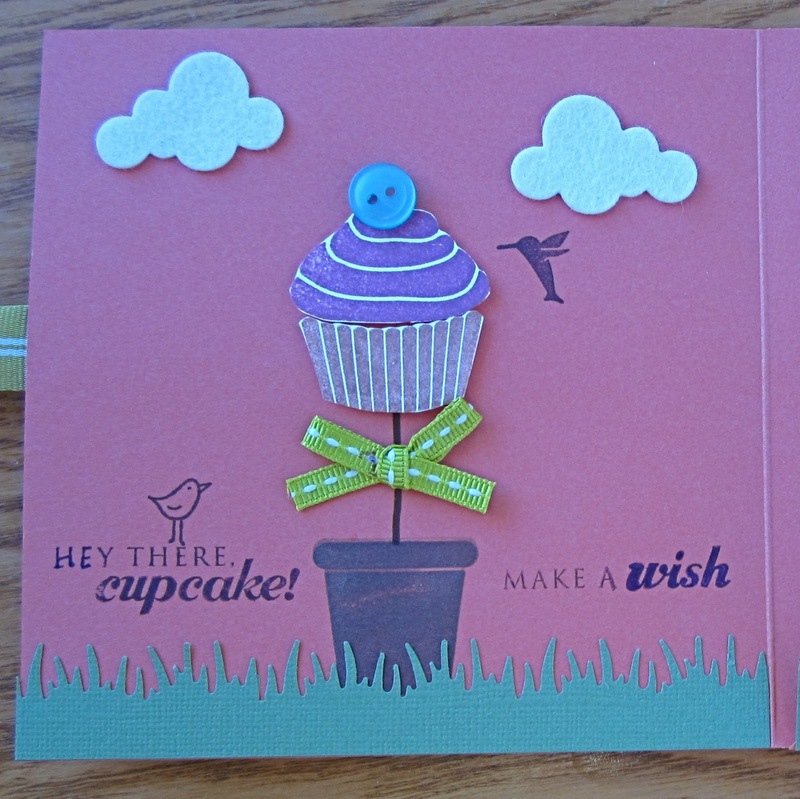 The cute birdie on top of the cupcake is from Paper Tales down in San Diego. This stamp is an exclusive one to their store. You may be thinking that it looks like it could be an A Muse image because it sorta is in a way. Nina Seven is an illustrator for A Muse and many of her illustrations are turned into stamps for A Muse and I believe she designed some images for Paper Tales as well. 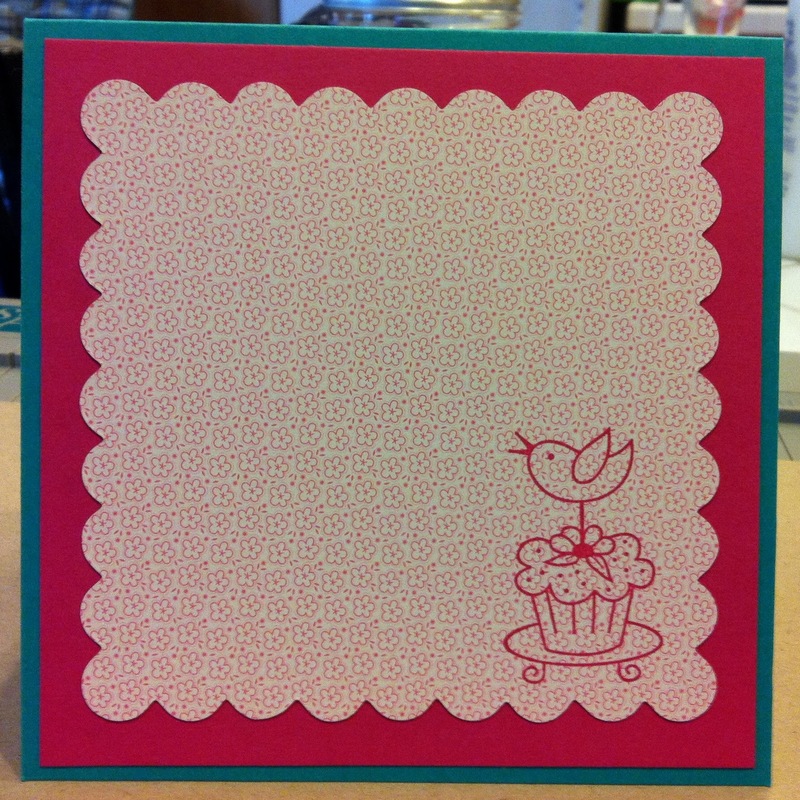 I stamped the image with Melon Mambo onto a larger scallop square of the cherry blossom cardstock. This ink coordinates so well it! 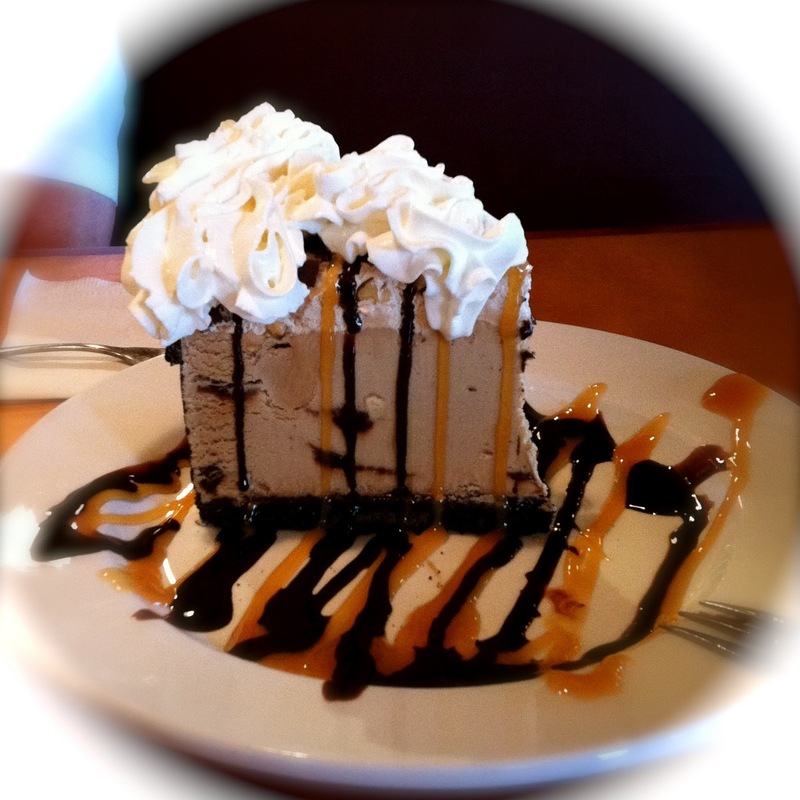 Finally, take a look at this dessert our server brought out for us to share! It was yummy mud pie dripping with chocolate and caramel sauce...we didn't even finish it! I had a great time lunching with Barb for her birthday and chatting the lunch hour away! Thanks for stopping by and stay tuned shortly for another post of what present I made for Barb! This time won't have to wait a few weeks for it! A high school friend and his wife are expecting their first baby this month and I recently made them some thank you cards. They are expecting a girl so of course I had to jump at the chance to go ALL pink...not that it's my favorite color or anything! I wanted to keep the card design as flat as possible so there wouldn't be any concern with having to use more than one postage for mailing. I used kraft cardstock by Papertrey Ink as my card base. It's a good heavy 100# cover weight perfect for one-layered cards. 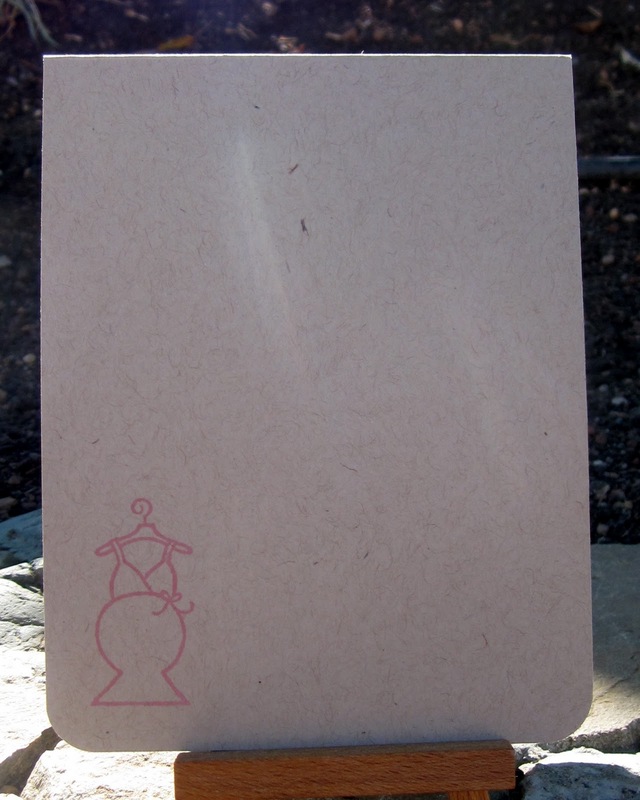 I stamped tiny hearts randomly on the card using Rouge Fluid Chalk. For the main image, I stamped the crib by A Muse onto white cardstock and colored with my Copic markers. Then, I stamped the crib again onto Pink Gingham cardstock and cut out just the rectangle piece of bars. I used some light brown Copics to color the bars on the gingham piece to match the rest of the crib on white cardstock. The image is layered onto Leapfrog cardstock by Bazzill. 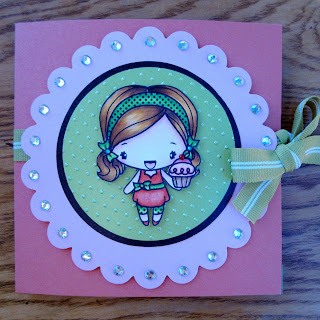 I used a Marvy Scalloped Circle punch and then punch holes into each scallop with a paper piercer. 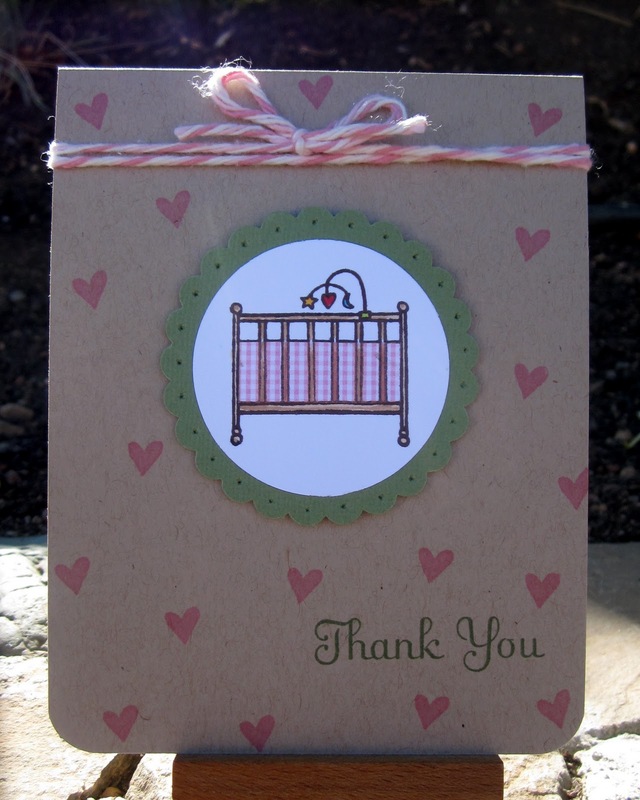 The 'Thank You' sentiment is by Stampin' Up! The pink and white twine is actually thin cotton yarn by Lily called The Original Sugar 'n Cream. It's a bit thicker in weight compared to craft Baker's Twine. 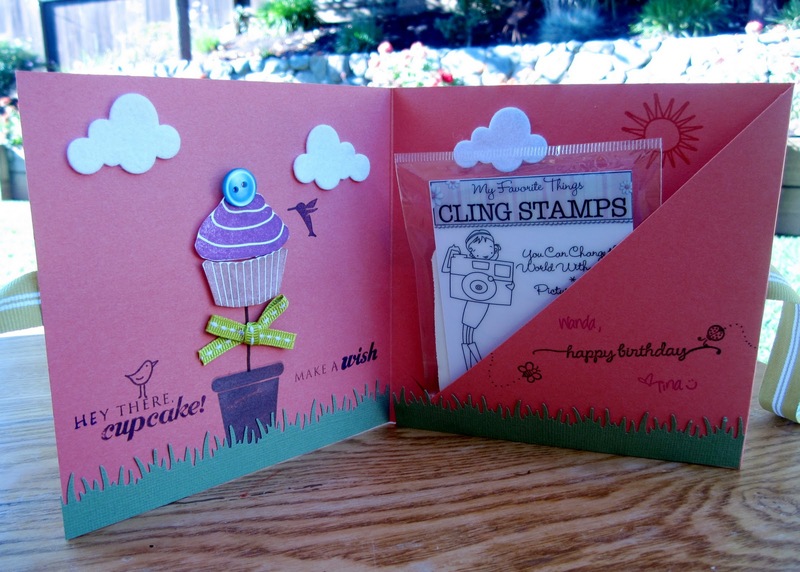 I kept the inside of the card really simple by stamping this cute image by A Muse. I wanted leave enough space for my friends to write their notes. I heard back from my friend's wife the other day and she totally loved them! Yay! Have a great rest of the week! Halloween is just around the corner...can't believe how fast it's approaching! Last week, we went to a birthday party for a girl who turned four years old. I wanted to make her a gift that would be fun yet practical. 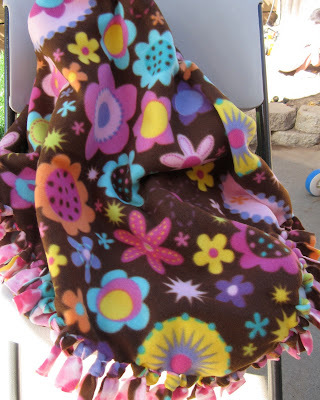 I decided to make a no-sew fleece blanket for her since the weather is beginning to get a little chillier in the evenings. Isn't this such a fun and colorful pattern for a little girl? I really like it too! Here's a pic of the front side and the flip side. I love how well both patterns go well with each other. 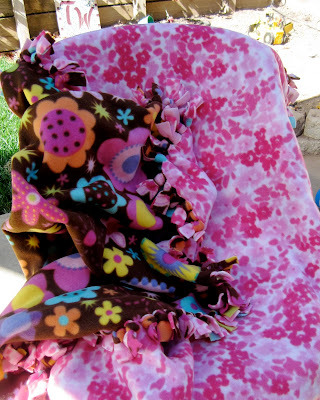 I bought the fleece at JoAnn's and got a total of 3 yards (1 1/2 yards of each pattern) to make the blanket. I trimmed the ends off that showed the manufacturer name to get a clean edge. Then, I laid the fleece one on top of each other evenly. I cut a scrap piece of heavy cardstock into a 5 inch square and laid it down on each square end of the fabric on four corners and cut the square off. Be sure to use a sharp pair of scissors. With a long ruler, I cut one inch strips in width all the way around the outside of the fleece. Then, I took the strips and tied knots all the way around the perimeter to secure both pieces of fabric. The whole process from start to finish took me about 2 1/2 hours to complete. That size is perfect for a four year old...big enough as a blanket and when they get older, it will be great as a throw blanket. One of my friends, Maria, made me a no-sew fleece blanket and she used 2 yards of fabric and it's the perfect size for me! Here's the gift bag I made for the blanket. I took a kraft shopping bag and used 5 inch circle stickers from Paper Source to make polka dots on it. I cut some of them in half for the top and bottom of the bag. It's a quick and easy way to decorate when you are short on time! 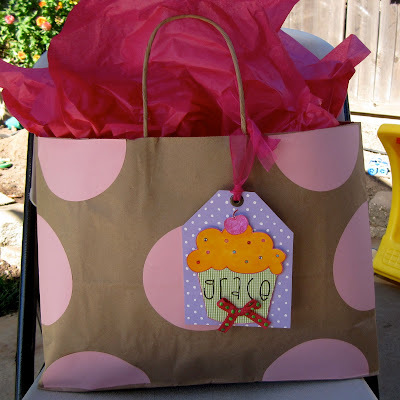 This is a close up of the oversized gift tag I made for the bag. 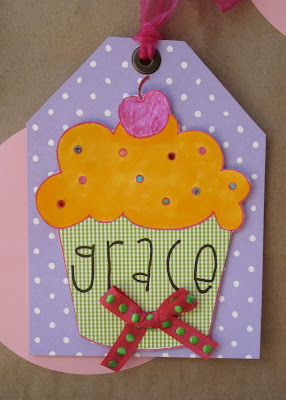 I used a piece of A Muse Kitchen Purple cardstock for the tag part and a large Cupcake background stamp from Stampin' Up!. I paper-pieced the paper cup using A Muse Gingham Grass cardstock. The alphabet letters are from a set by Kim Hughes. Finally, this is the birthday card my son made for his friend. He used Prismacolor pencils as his coloring medium. 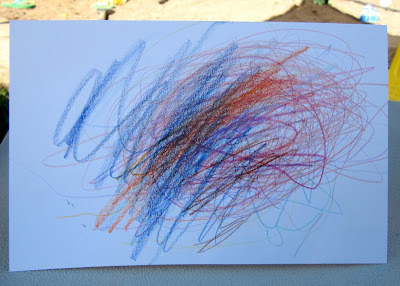 I believe he was practicing his circles and color blending! 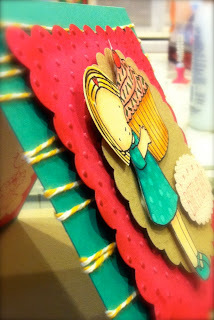 Card Tin for Wanda G.
Yep, I'm still here...just been super super busy! Just wanted to pop in and share a greeting card tin I made for my crafting sistah Wanda earlier in the year. Isn't that Elzybells image just the cutest? It's just the perfect image for a cardmaker! 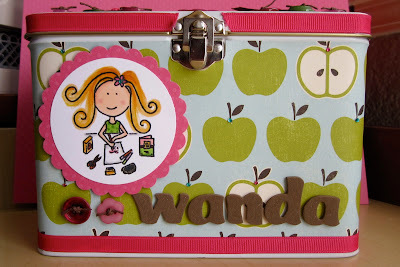 I colored her hair blonde like Wanda's and used American Crafts Thickers to spell out her name. 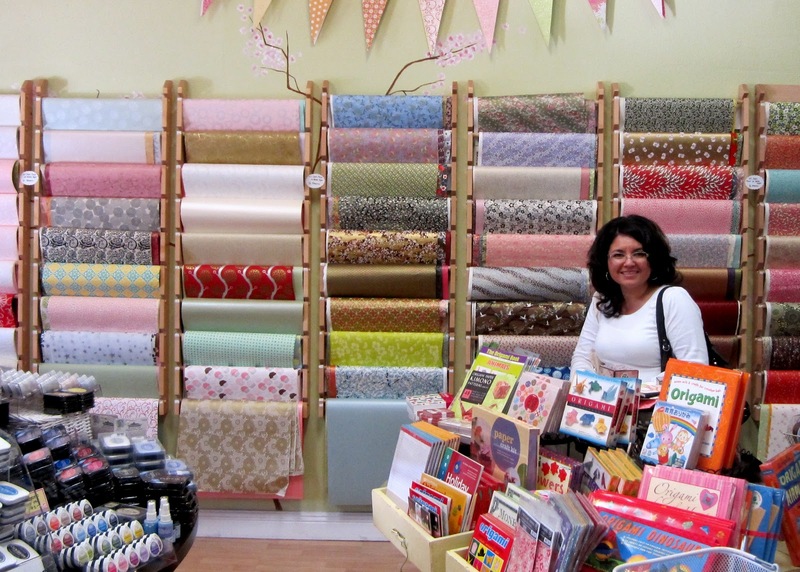 The apple pattern paper is from a collection by October Afternoon if I remember correctly. Of course I had to embellish the top with yummy ribbon and buttons to coordinate! 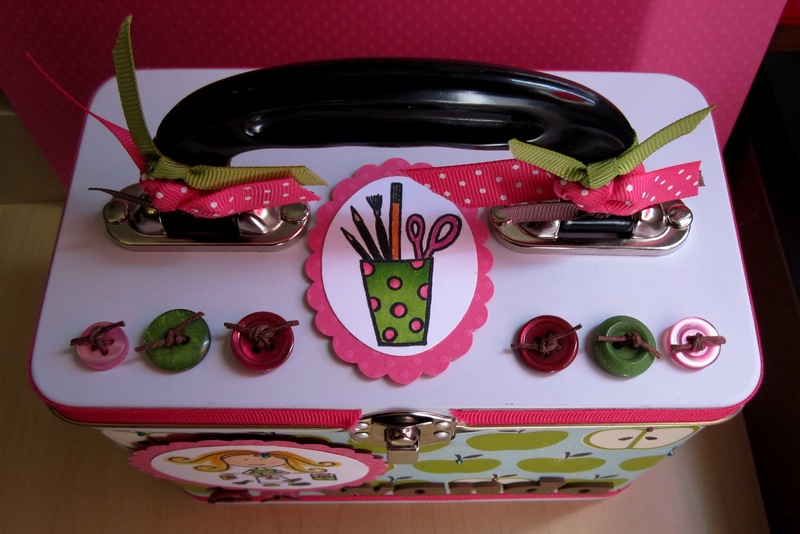 I threaded twine through the button holes and used glue dots to attach them to the lid. The crafty cup of supplies is by A Muse. I used my Copics to color the cup part and Spica Glitter pens for the pencils, brushes and scissors in the cup. I hope to be back more regularly so stay tuned and thanks for stopping by! Do you remember these thank you cards I made for my two best buds? I also submitted them for the A Muse Challenge in the Lounge last month and they made it into the Top 9 Round-up on the A Muse blog! Yippeee!!!! There were so many great card ideas and many entries from both newbies and regulars...I totally didn't think I'd stand a chance! I was so excited when I saw mine in the round-up! Both my two friends, Barb and Maria, loved them and I'm glad they were enjoyed by others as well! Just wanted to share news and stay tuned for some new creations soon! Home base has been busy now that school has started! 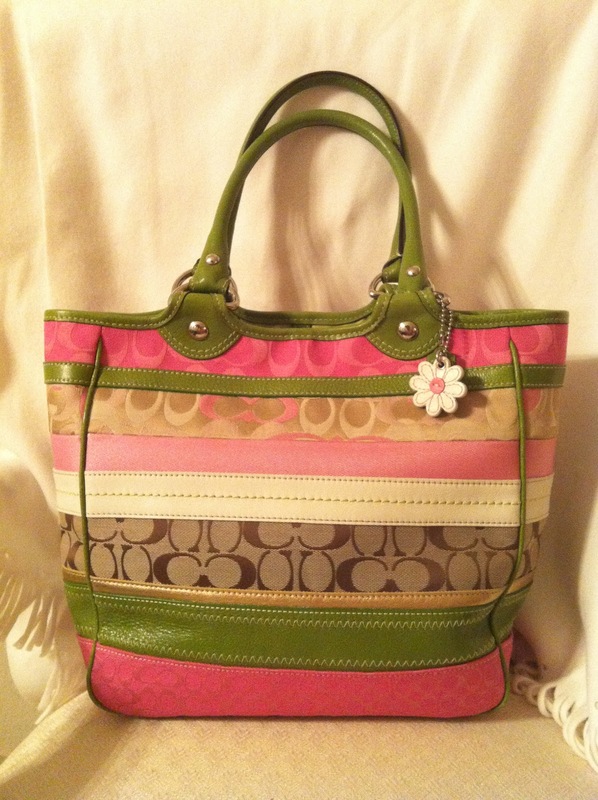 Oh, how yummy is this Coach Purse?! Just look at how colorful the pretty patterns and texture are on this beauty! Pink, brown, green, metallic gold...those are sooo my colors! But alas, this gem is not mine...she belongs to my crafty girlfriend, Barbara. She has the coolest collection of stylish purses! One day when we were hanging out at her house, she showed me the purse and after drooling over it, I said that it was a total card inspiration. I told her she so had to make a card from it. This is what Barb gave me for my birthday...how stunning is this card! I felt so honored that she took the time to craft this just for me! The picture doesn't do it any justice, I quickly snapped it with her purse when I was at her house. I love all the patterned paper Barb used to layer the different strips on the card! I could tell she had put a lot of thought in coordinating all the papers together like the purse. I didn't notice the flower on the card was the cute flower charm chained on the purse until I compared both items side by side. 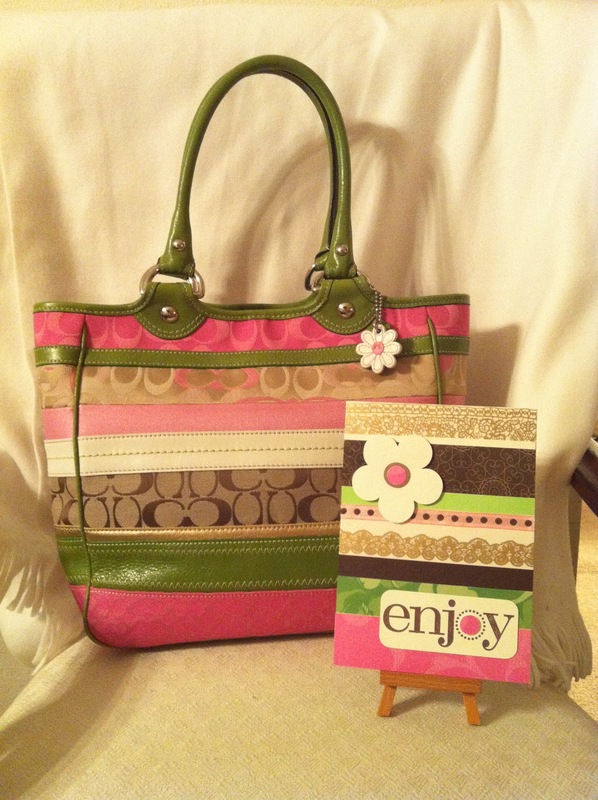 I told Barb she better keep a close eye on her cutie Coach tote when I'm over to visit or else it might walk out the door with me...hee hee! Maybe that's why she made me the card! 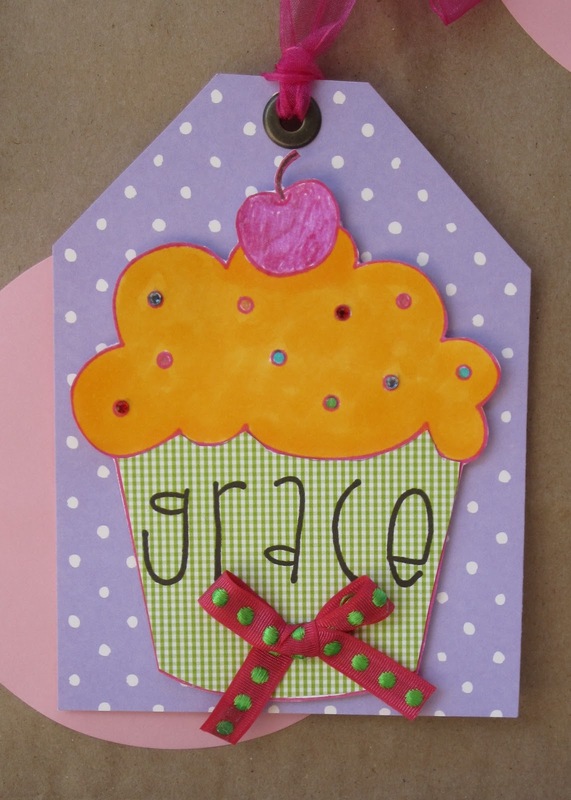 Thanks a bunch Barb for the gorgeous card! 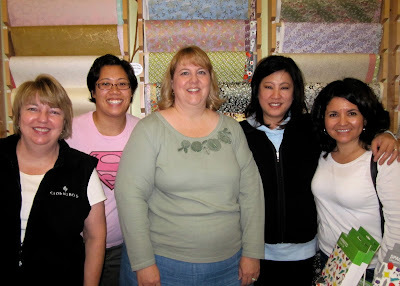 I'm so lucky to have a close group of talented and generous crafty gals that I call my best friends! Last weekend, my family and I went to a San Francisco Giants ball game against the San Diego Padres at AT&T Park in San Francisco. We had such a blast that day! One of the drilling companies that my husband's work does business with paid for all of us to get in. When we arrived, we all got a Giants ball cap, company t-shirt, and all the kids were given some pocket change for snacks and such. What a treat for all of us. We also arrived in time for all the kids to get a giveaway bright orange baseball shirt! I thought I would make the drilling company a card so my husband and his co-workers could sign thanking them for their generosity. Of course I had to use Destination Cuppie in San Francisco from Taylored Expressions for the main image. I also incorporated orange and black for the Giants team colors. I used the Clouds paper from A Muse for the background so it wouldn't look to Halloween-y. I colored this image with my Copic markers. For the sandy area, I used a kitchen rag soaked in colorless blender to give it a more sand-like texture. I randomly stamped baseballs all over the inside of the card in Tangerine Tango by Stampin' Up!. For the baseball, I punched out a circle from white cardstock and took a red marker to draw the stitching of the ball. Then, I stamped the sentiment by A Muse in the middle. I then punched out a smaller circle, cut it out in a spiral design, and attached one small end to the card and the other to the baseball for a 3D effect. Thanks Pitcher Drilling for such a fun and fabulous day! I made a pair of thank you cards for my two best girlfriends when we went out to dinner and a movie to celebrate my belated birthday. We ate dinner at a Vietnamese restaurant across from the theater (very convenient) and of course saw the third Twilight movie, Eclipse. We loved it! I made my own background on the card by repeatedly stamping the popcorn and tiny heart stamp in rows. I stamped all those bags of popcorn for one of my girlfriends who always has to buy some for every movie she sees no matter what! Hee hee! 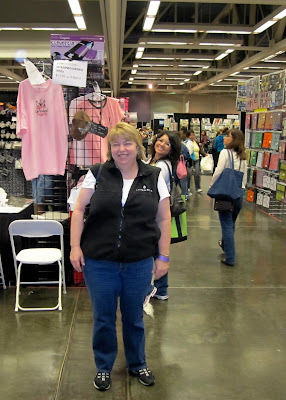 Then, of course I used the wolf stamp because we root for Team Jacob! I was testing out different ways on how to color Jacob...I mean the wolf...and I got a couple of different results from it. I called this one the hairy wolf image. I think I used about 3-4 different shades of brown Copic markers along with the colorless blender to achieve this effect. I first colored the whole image with really light shade of beige. Then for each layer of hair, I took that beige shade and used the marker-to-marker tip technique for each darker shade of brown. I then did grass brush strokes by flicking the brush tip of my marker. After, I took an old textured kitchen rag soaked with some colorless blender and pounced it over the entire image. I held the rag down in 2-second increments. I then went back at the end and added a few more brush strokes of "hair". On the second card that I call the furry wolf, rather than laying down a base color, I just used the light beige marker and did the same marker-to-marker tip method to each of the darker brown shades and colored in small circles. To finish it off, I used the soaked rag with color blender again. Here's the inside of the card. I roughed up the edges of the recipe a bit to give it a more old and rusty feel like Bella's red truck. For dessert, my friend Barbara brought a little box of different cupcakes that she snuck into the movie theater in her purse. I couldn't even tell she stashed the box in there! 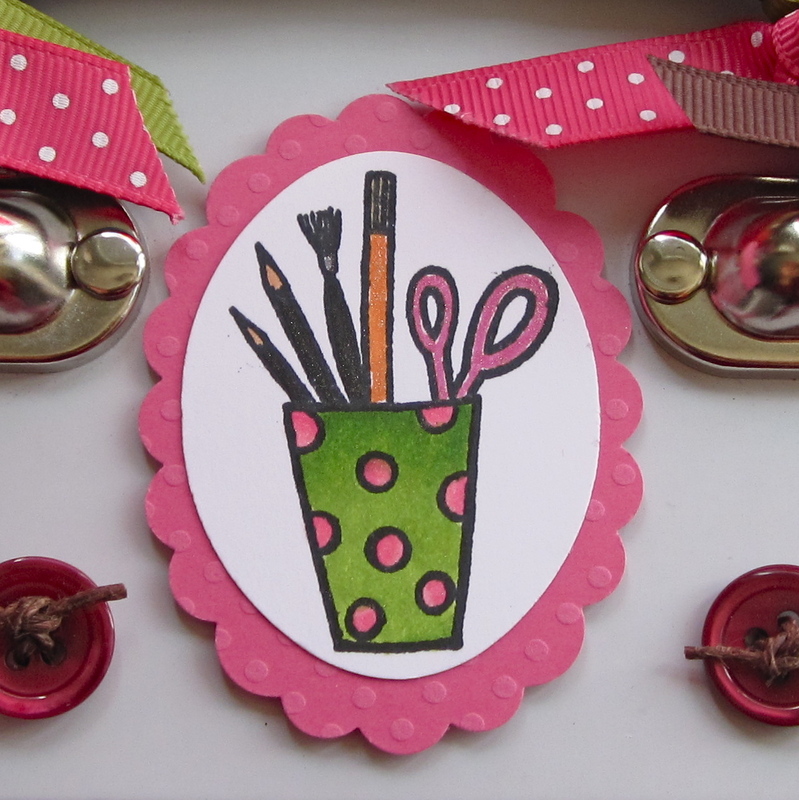 I hope you enjoyed checking out my thank you card creations. I wanted to capture each element from the wonderful time I had with my two girlfriends! P.S. This card is also for the A Muse Lounge Challenge #19. 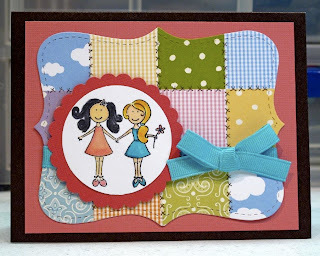 This month's challenge is "Stick to the Pattern" where we are to create a card using any A Muse stamps or paper and making a pattern on it. Head on over to the Lounge to check out all the other entries!